The month of November was Down on the Farm at Gingersnap Creations. I was looking for some chicken wire paper, but never came up with any. I found an old vegetable bag in my stash, but it was red, it kind of looked like chicken wire. Nope, I didn't make it to the local hardware supply. So I thought I would lay the veggie bag on the paper and use it as a stensil. When I started dabbing the green ink pad on it came out like you see, no chicken wire effect, but I kind of liked what I was getting so I decided to go for sky and grass. I cut the nest out by hand and stamped it with my wood grain background stamp and sponged the edges. I have to give credit to Susan of Cat's Ink*Corporated, she made a card 8-31-10 with a felt chicken made with punches. That is where I got the idea to make this Speckled Hen with part of an Oval, the tip of a star, and 3 different hearts. I glued a tiny black bead for the eye, went around it with a fine black marker, and dabbed the hole with my white gel pen. Thanks Susan--my chick is a little different than yours, but your idea is fantastic. And Thanks Gingersnappers for all you fun challenges. I just love this "speckled hen." Fabulous card and I love all the searching that went into this beauty! Enjoy! Brilliant speckled punchy hen- I love it! The background is wonderful- and I love the nest and the raffia hay. Lovin' that nest! Too cool! Oh this is so gorgeous Beverly and a perfect way to use the raffia!!! 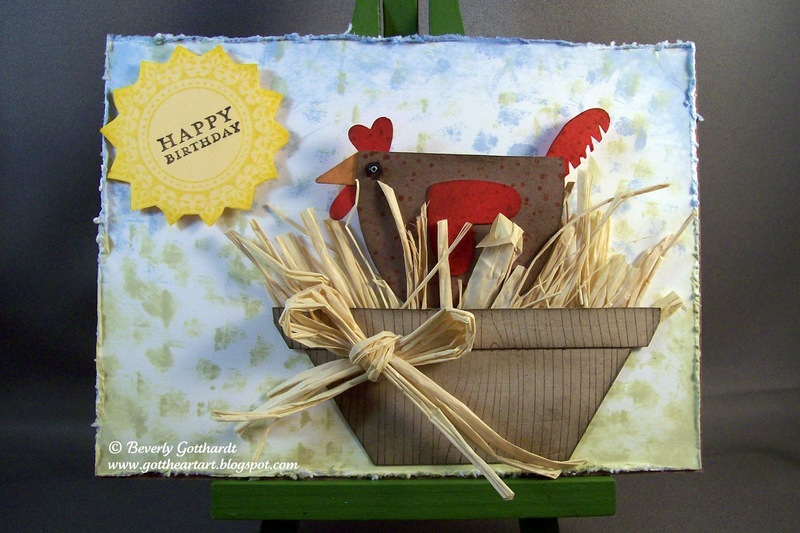 Your chicken is fabulous ... and the raffia is such a perfect little nest ... so glad you joined us at Gingersnap Creations.